Asthma in cats is a chronic inflammatory condition that affects the airways. This disorder is also known as feline bronchitis or feline bronchial disease. Just like human asthma, feline asthma causes the bronchi to constrict, causing attacks of coughing, shortness of breath, and wheezing. Sometimes, a mild feline asthma attack may be confused with a hairball episode. Or, the cat owner may think that the cat is choking on a piece of food. Usually, the cat may quickly recover after this type of an asthma attack and be symptom-free for a period of time, leading the cat owner to dismiss the whole incident. However, severe attacks can be life-threatening. Just to be on the safe side, take your cat to the vet as soon as you see any signs of distressed breathing. Environmental elements such as cold, humidity, and heat can also trigger an cat asthma attack. Stress and physical exertion can also trigger an episode. A respiratory condition caused by a bacterial agent or a virus can add to the seriousness of the disease. 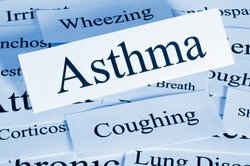 Typical signs of an asthma attack include: labored breathing, coughing, sneezing, and/or wheezing. Sometimes the cat will make a choking or gagging sound as well. Sometimes these symptoms may be confused with a hairball episode, as previously indicated. However, the cat will position his body slightly differently than if he was just trying to get rid of a hairball. During an asthma episode the cat will get into a hunched position and will put his neck and head forward, visibly struggling for breath. If the attack is severe, the cat may try to breathe through his mouth. Several respiratory conditions may have similar symptoms as cat asthma. Some of these diseases include: cardiomyopathy, heartworm-related respiratory disease, lungworms, lung cancer, and respiratory infections. 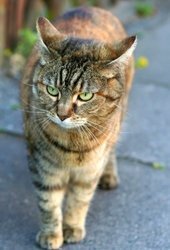 So how can you be sure that you cat suffers from asthma? There are several tests your vet will use to determine whether your cat has asthma or if he suffers from another disease. The following are some of the most common tests. Blood Tests. These tests will determine if an infection is present. They will also help in studying the state of major organs and in ruling out other diseases with asthma-like symptoms. X-Rays. A chest x-ray will help your vet find any anomalies in the lungs and diaphragm. It will also detect any inflammation and/or infections. A chest x-ray may also find heart problems. However, further tests may have to be conducted to confirm if your cat has a cardiac disease. This is the most effective test to diagnose asthma in cats. It consists of removing a fluid sample from the bronchioles (small airways of the lungs that stem from the bronchi). This sample is placed under the microscope to determine if there is any increase of eosinophils, which are a type of white blood cells. Eosinophils deal with parasitic infections. Allergies and asthma are major causes of eosinophilia, the production of high amounts of eosinophils. This test can also detect lung cancer. Steroids. Corticosteroids are used to reduce lung inflammation. These medications can be administered either by injection (depo-medrol) or orally (prednisone). The problem with this method is that the medication is distributed to the whole body, causing several side effects and long term health issues. A better option is to use a Metered Dose Inhaler (MDI) in conjunction with an aerosol chamber especially made for cats. This way, the medication goes directly to the lung. See the Inhaled Treatments section below. Bronchodilators. A bronchodilator is used to counteract a severe attack and open the airways. This type of drug can be administered either by injection or orally. Again, this method causes the drug to go to the entire body, which can have negative effects on the cat’s health. Fortunately, bronchodilators can be administered using an inhaler and aerosol chamber. Inhaled Treatments. Both steroids and bronchodilators can be delivered using an inhaler (MDI) and an appropriate aerosol chamber (see AeroKat info below). In fact, this is the most effective option as it delivers the medicine directly to the lungs. Typically, two types of medications are used: a corticosteroid, usually Flovent® (Flixotide® in the UK), and Albuterol, a bronchodilator. By the way, Albuterol is very effective and it can act very quickly. Albuterol can be administered using with an inhaler or a nebulizer. This medication is used to treat respiratory distress. Albuterol is considered a relatively safe medication with few side effects. The AeroKat Feline Aerosol Chamber is especially designed for cats. It is used in conjunction with a Metered Dose Inhaler to deliver aerosol medication to your cat. A nebulizer is used to deliver a light mist of medication while your cat stays inside a covered cage or carrier. You can use a nebulizer to distribute Flovent® and Albuterol. You can place your cat inside a cage, cover it (you can use a thick towel), and introduce the tube through one of the cage’s openings. One drawback is that your cat may get scared with the hissing noise of the oxygen. You can also try gently inserting the tube directly into the cat’s mouth. Some cats will accept the tube without any struggle others may not. Another way is to place the tube near the cat’s nose so that he can breathe some of the oxygen. Consult your vet to determine how long you should administer oxygen to your cat in each session. He or she will also give you information on how to obtain this equipment, costs, etc. Acupuncture. This has shown to be a good complementary method and can be used alongside all other medications and therapies. It is widely used in the treatment of asthma in humans and has shown to markedly reduce the amount and severity of attacks in a significant amount of people. Learn more about acupuncture and other alternative medicine for cats. Always consult a vet if you believe your cat is sick. The following sites have a wealth of information about asthma in cats. Highly recommended. As you can see, even if your cat has asthma, he or she can have a good quality of life.